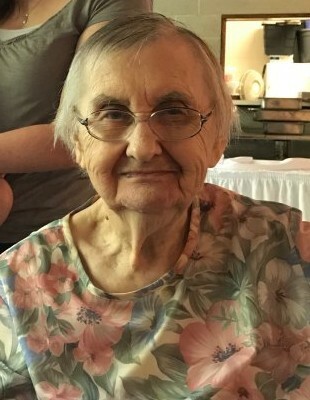 Obituary for Mildred S. (Steigerwalt) Hoppes | Hartman Funeral Home, Inc.
Mildred S. Hoppes, 86, of Tamaqua, died Sunday, January 13, 2019, in her home. She was the wife of Berlyn C.W. Hoppes. They were married on May 2, 1953 and celebrated 65 years of marriage. She was a homemaker and dedicated her life working on the family farm. Mildred was a devoted wife, mother and grandmother. Born in West Penn Township, she was the daughter of the late William A. and Sarah R. (Mertz) Steigerwalt. She was preceded in death by a sister Florence Hoppes. Surviving are two sons, Bruce and his wife Margaret, TX, and Ronald, WA; a daughter, Margie, wife of Daryl Schock; a sister, Gladys Zehner, both of Tamaqua; six grandchildren, Eric Schock, Holly, wife of Travis Heisler, Victoria, Zachary, Justin Hoppes, wife Jeannie and Jill, wife of Justin Imbody, great granddaughter, Emily Heisler, former daughter-in-law, Lori Hoppes, Tamaqua; a niece and nephew. Funeral service will be held at 7:30 pm Thursday, January 17, 2019, in St. Peter’s Church, West Penn, 184 St. Peters Rd, Tamaqua, PA 18252, with Rev. Ken Melber officiating. Friends may call Thursday from 6-7:30pm in the church. Private interment in the church cemetery. Contributions may be made to the church. Hartman Funeral Home, 1791 West Penn Pike, Rte. 309, New Ringgold, is in charge of the funeral arrangements. Online registry and condolences may be signed at www.hartmanfuneralhomeinc.com.